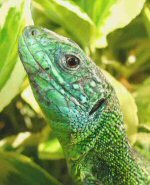 The Lacertids are a large family of Lizards found primarily in Europe and Asia although a few do get into Africa. Often referred to as the "Typical Lizards", I probably keep more of these than all the others put together. A newly hatched Green Lizard (Lacerta viridis bilineata). Note how little green there is at this age and the two lines that give it its latin name can hardly be seen. Green Lizard (lacerta viridis bilineata) This is one of my large males. As you can see, he is a little battle scarred! Green Lizard (Lacerta viridis bilineata). A lovely group in one of my outdoor vivaria. This illustrates the amazing range of patterning that can be seen in these lovely animals. 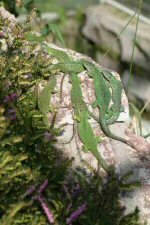 Green Lizard (Lacerta viridis bilineata). This is a juvenile female. Although a year old still hardly any green - but the two white lines can be clearly seen. Green Lizard (Lacerta viridis bilineata). This is Big Boss, the dominant male in one of my large outdoor vivaria for many years. We finally lost him during the winter aged seventeen and a half years. Italian Wall Lizard (Podarcis sicula campestris) This is a large and elderly male who has been with me for many years. 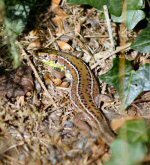 Italian Wall Lizard (Podarcis sicula campestris). Although the males are rather splendid I find the more subdued markings of the females such as this more beautiful. This is a picture of my thumb! Additionally there is a hatchling Italian Wall lizard (Podarcis sicula campestris). The smaller lacertids, unsurprisingly, hatch small babies!